Flyline solar charging device is regulate the voltage and current coming from the solar panels going to the battery. Most “12 volt” and “24 volt” panels out put is 16 to 20 and 26 to30 volts, if we connect this solar cell directly to the battery or any other electronic equipments it will damage within a period. 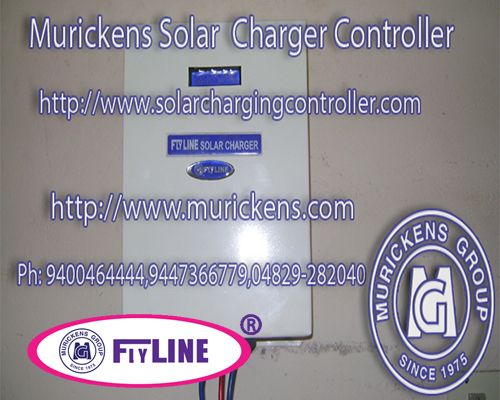 Murickens manufactured renewable energy charge regulator with several safety features including the prevention of overcharging the battery bank during peak sun output, and discharging the battery bank through the solar array at night. Murickens manufactured and market three types of charging controllers MOSFET circuit , IGBT circuit and MPPT circuit charging controller with international quality. * The main advantage of Flyline Solar Charger is high efficient " Zero Drop" (we get 100 % efficiency). *Comparing to MPPT, there is no heat conversion efficiency lose in this special model. *German MPCT ( Maximum power converting technology ) Technology assures the quality of product. * ISO 9001- 2015 certified Flyline Solar Charger. * It is commonly used products. * This charging controllers are used for smaller and medium power controlling units. * The technical features are same with IGBT. * The control system controls the whole system taking care of battery over charging cut off, deep discharging cut off, protections in battery reverse, PV reverse, Overload and Short circuit. * Our product connection diagram printed on it. *Micro controller based. *LED, bar glass or LCD - display-battery voltage, load on/off, battery condition charging on/off. *Up to 70 amp auto detection for 12v/24v (automatic sensing). *It is used for high voltage regulations. ?German Technology assures the quality of Flyline Solar Charger. *ISO 9001- 2015 certified *Zero Drop model (we get 100 % efficiency). *It is commonly used products. *IGBT charging controllers are used for medium and higher power controlling units. *The technical features of MOSFET and IGBT are same. *The control system controls the whole system taking care of battery over charging cut off, deep discharging cut off, protections in battery reverse, PV reverse, overload and short circuit. ?Micro controller base. ?LCD display-panel voltage , battery voltage, out current, solar in use, direct mains, saved unit. * In the art of solar MPPT (Maximum Power Point Tracker) determines the ideal operating point via processor –controller algorithm. This significantly of incident light and temperature. * The control system controls the whole system taking care of battery over charging cut off, deep discharging cut off, protections in battery reverse, PV reverse, overload and short circuit. *MPPT Solar Charger have a power to increases the photovoltaic array power yield. *It is most suitable for smaller power applications. If we use for higher application heat conversion lose is very high.